We think of Franz Peter Schubert nowadays as a composer of innovative genius with great lyrical gifts. But this genius only became visible from his mid-teens onward. It took some time for his family to recognise his musical talent. Up until his eighth birthday what stood out was his singing voice. A voice so remarkable that it seems to have at some moment prompted someone to imagine that little Franz Peter might be able to become one of the Austrian Emperor's ten Sängerknaben, boy choristers, in the court chapel. It would be a good move. As a chorister Franz Peter would receive a high-level grammar school education that would stand him in good stead when he needed a proper job – for example, say, as a schoolteacher in the family school. Most importantly, that valuable education would cost his father nothing: classes, board and lodging would be paid for. His father appears to have set in train a plan to attain this goal, a plan that was carefully thought out, well executed and took four years of application to achieve. Dedicated, stubborn application in the pursuit of his goals was one of the hallmarks of the father's personality. We saw it unmissably in his father's own career. The first step in this plan was taken in 1804. Schubert's father entered Franz Peter, then seven, for a proficiency test for would-be choristers. The adjudicator was Antonio Salieri (1750-1825) – now inescapably remembered as Mozart's bitter enemy in Peter Shaffer's play (1979) and film (1984) Amadeus, a play that traduced his reputation badly. Salieri was still one of the great names in music in Vienna. Antonio Salieri. Lithograph by Friedrich Rehberg, 1821. Image: Wienmuseum. The test was held on 28 September 1804. There were 19 entrants for the test, nine of whom passed. Schubert was in the successful group, obtaining a rather mediocre sixth place. Never mind, this test had only been a dry run for him – he was still far too young. Choristers were educated at the Akademisches Gymnasium and therefore had to be at least ten years old. Schubert, only seven, had now time to prepare for that goal. The preliminary test had done what it had to do – it had confirmed to Schubert's father that his son was vocally exceptional and that he had a good chance of being accepted as a chorister. Further investment of time and money in the scheme was thus justified. The plan went forward. The plan started to be developed almost immediately after that proficiency test. It followed three lines of development: instrumental skills, educational attainment and singing skills. In the first part of the development of his instrumental skills he was taught to play the violin by his father. In his eighth year I instructed him in the preparatory knowledge for playing the violin and exercised him sufficiently so that he was able to play light duets quite well. Deutsch, Erinnerungen, p. 244. Translation ©FoS. Translator's note: No, the translator has not been at the drink, but is frequently driven to it when trying to render accurately the inflated waffling of the bureaucrats (among them teachers such as Schubert's father) who infested the Habsburg Empire of Paperwork. Let us slide over the uncertainty of Franz Peter's 'eighth year': taken literally, of course, it would mean 'whilst he was seven', but the everyday usage of 'whilst he was eight' is probably more likely – even for a pedantic schoolteacher. It would be quite strange to describe a seven-year-old as being in his eighth year. It really makes no difference, though. In the second part of the development of his instrumental skills his brother Ignaz – 14 years older than Franz Peter – was roped in to give him piano lessons, presumably also in Franz Peter's 'eighth year' but possibly some time later, when the child's hands were a bit bigger. But whenever it started, after a few months Ignaz had to give up, hopelessly outclassed. His little brother could work the rest out better on his own. I was quite astonished when, after just a few months of having piano lessons from me, he announced that he wouldn't need my teaching any more and could continue on his own. And in fact he progressed so far in such a short time that I had to recognise him as a master who was far beyond me, one whom I could never catch up. Ibid, p. 244. Translation ©FoS. It now became clear, if it had not been clear before, that they had a real musical talent on their hands. The second line of the plan was Franz Peter's educational development. For three years after that test, he continued as a pupil at his father's school. Those three years were academically critical because he was required to take three years of the Normalschule, '~secondary school', as a preparation for the Gymnasium, '~grammar school'. His school marks would count in the entry test. The third line of the plan was the development of his singing skills. He was sent for singing lessons to Michael Holzer (1772-1826), the choirmaster at the neighbourhood church in Liechtental. Holzer is an interesting character: he had a close relationship with the Schubert family, their friends and neighbours. He seems to have enjoyed his drink. He was certainly an important influence on the young Schubert and he did everything required of him to prepare him for the great moment. If we believe father Schubert's memory of Holzer's remarks, noted down a quarter of a century after the fact, and if we believe that Holzer is sober and sincere in his praise – why wouldn't he be? – we might suspect that Holzer's easy-going and encouraging manner was a refreshing change for Franz Peter from the pedantry of a family of school teachers. Who knows? We should probably also treat the restrictive term 'singing lessons' with some caution. It seems more likely that Holzer covered a broader field with his young protegé than strictly singing lessons, helping him to achieve the musical maturity that so astonished those who met him. Schubert himself acknowledged the role Holzer played in his musical development and always showed great respect for him, dedicating to him his Mass in C (D 452) and his Tantum ergo in C	(D 460). The great Schubert scholar Otto Erich Deutsch regarded Holzer as the most important early musical influence on Schubert. Those who may still doubt the existence of a plan to prepare Franz Peter as a chorister should compare its elements – schoolwork, singing, violin, piano – with the marking categories used for the Sängerknaben in the Konvikt– they are identical. Franz Peter turned ten on 31 January 1807, which meant that in the normal run of events he could have started his classes at the Gymnasium in that autumn. But the family now just had to wait for a chorister position to become free. The wait lasted until the following May, when two chorister places were advertised. The entrance test took place on 30 September 1808 in front of Salieri and a school representative. The test was not only of the applicants' voices and singing abilities but also of their general musical abilities. Applicants also had to provide evidence of their scholastic ability, too: school reports, in Schubert's case presumably written by his father. This time Franz Peter passed the test with distinction. His father and Holzer had done a good job. Franz Peter had been prepared musically and educationally for the admission test, but we know nothing of the other strings that had been pulled in the dark corners of the imperial and clerical administrations that would have constituted the final, unseen line of the plan. Franz Peter's father was a highly respected and well-connected school director. There can be no doubt that Franz Peter gained his place on merit, but there can also be no doubt that the success of the four-year scheme to get that place would not have simply been left to the whim of a judging panel. This was imperial Vienna after all, where connections were everything. The parents of all the other candidates would be doing their best to game the selection process, too. Do we have any evidence of this? Of course not! – this activity was the one thing that was never written down in the Habsburg Empire of Paperwork. But, in contrast, most of father Schubert's plan is visible in all its majesty. At the end of 1804, when his father's scheme began, Franz Peter had been just a seven-year-old with a nice voice. Over the next four years he was systematically coached in music and ground through his school work, so that, when the eleven-year-old finally entered the choir, he had blossomed into a musical talent. This preparation period was the musical foundation of the great composer. Without that plan there would have been no composer Schubert – perhaps only a forgotten schoolteacher from a forgotten Viennese family of schoolteachers. Thank you, father Schubert, Michael Holzer and Ignaz! The plan had been a good one. Franz Peter was now going to get a Gymnasium schooling, much like his father and uncle had received in the Jesuit Gymnasium in Brünn, an education that had lifted them off the provincial farm and taken them to Vienna, the imperial capital. Had Franz Peter followed the course to the bitter end he would have had an educational basis for a career in the Empire. Perhaps university, then a bureaucrat's post somewhere. Grillparzer was a court employee, scribbling for Franz II; the Spauns, Mayrhofer and most of Schubert's friends followed the path of the imperial civil servant, because that was the only path available for most young men that would provide a regular income, the opportunity to marry and, after a few decades of scribbling, a small pension for their dotage. So finally, in November 1808, Schubert and two other new boys began their time as Sängerknaben in the Stadtkonvikt in Vienna. Our tender-hearted readers are already reaching for their monogrammed silk handkerchiefs to dab away the tears welling up at the thought of the diminutive, introverted, sensitive child genius thrust from his family into this heartless institution; at the vision of the little 11-year-old all alone in the boarding school. Nevertheless, we need to control ourselves: millions of children down the ages have experienced a similar rite of passage. It would have been much the same for Schubert as it has been for everyone else. His father tells us in the account from which we quoted above that Franz Peter was a sociable boy who liked nothing better than spending time with his cheerful friends. This is not quite the Schubert that his later friends would describe, but it can stand here unchallenged. He had grown up in the bedlam of a schoolhouse in a small apartment in a Viennese suburb. The German novelist Peter Härtling opened his novel of Schubert's life by imagining the cacophonous surroundings in which he must have grown up – the cramped apartment, the school house, the busy Viennese suburb teeming with people, tradesmen and traders. If we follow Härtling's idea further, we might begin to see the orderly boarding school as being for a large part of the day a temple of calm in comparison to the turmoil at home. Franz Peter Schubert would spend the next five years here, in the Konvikt. What was it like? Well, firstly, we English speakers have to purge our minds of all the negative associations caused by semantic interference with the English word 'convict'. Konvikt is a name for a Catholic boarding school, particularly in Austria. The word is derived from Latin convictus, 'living (or dining) together' through convictum and ultimately from convivere, 'to live together'. English speakers would simply call it a boarding school. Admittedly, there were moments of depression when Franz Peter, chafing at the regimentation, referred to it as a 'prison', but not because of any association with the name. These Catholic boarding schools were set up by the Society of Jesus, the 'Jesuits', the Counter-Reformation order founded in 1540. In those heretical times they were institutions that would take children out of their homes into the doctrinal safety of Jesuit schools. They were also regarded as places to raise the next generation of Jesuit priests and teachers. The Gymnasium in Brünn, to which Schubert's father and uncle had been sent by their pious father, was a Konvikt in everything but name. The Stadtkonvikt, the 'City Boarding School' in Vienna was founded in 1554. In 1622 the Jesuits were placed in charge of the University of Vienna and the first steps towards the symbiosis of the Stadtkonvikt and the university were taken. The Jesuits experienced around two centuries of increasing dominance in the religious and educational life of the Habsburg Empire. Their enemies finally got the upper hand and the order was suppressed in the Austrian Empire in 1773. The Vienna Stadtkonvikt was abolished in 1782 by Joseph II. Its abolition appears to have been just another one of Joseph's rash decisions, because in 1802, only 20 years after its abolition, it was reanimated by Franz II and now run by the Piarist order. By decree on 25 March 1802 the building that had housed the former Jesuit school (Universitätsplatz 796) was handed over to the Piarist order and became the new Stadtkonvikt. However, before we can go any further we have to clear up some terminology. Readers may be bored, but at least they won't be confused. We have to do this because generations of Schubert scholars – especially those writing in English – have muddied these waters through imprecision. Drawing by Salomon Kleiner (1700–1761) of the Jesuit Church (centre) and the Jesuit Kollegium (right) in 1724. The Stadtkonvikt was housed in the Kollegium from 1802 onwards. The building on the left became the Aula of the university. Image: Österreichisches National Bibliothek. The Konvikt was in itself not an educational institution: it offered board and lodging and, as a recreational activity, the opportunity to make music and learn to play one or more instruments. 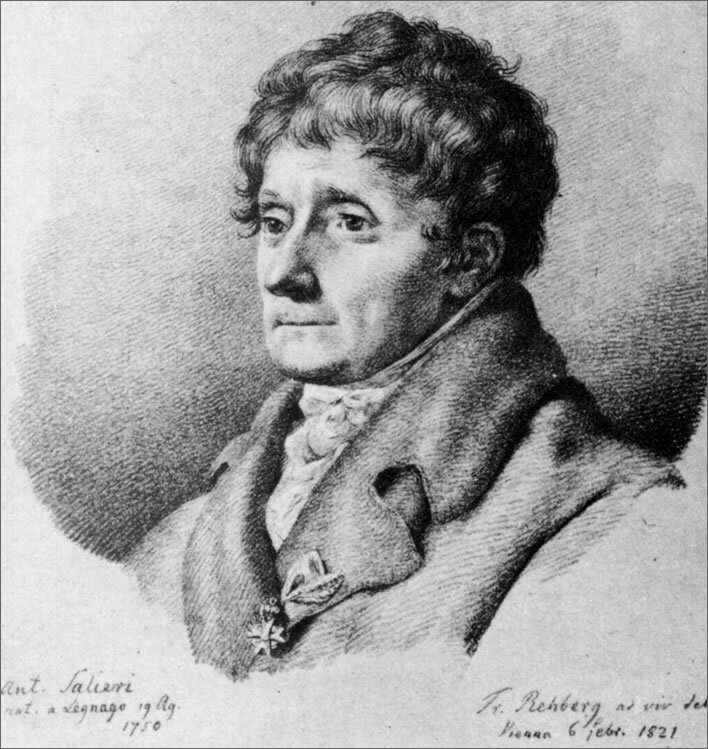 The Director of the Konvikt in Schubert's time was Dr Franz Innozenz Lang (1752-1835). In addition, there were two educational institutions in close association with it: the Akademisches Gymnasium, the 'Grammar School', which offered a six year course that was regarded as a preparation for a university course, and the University of Vienna. The Director of the school (under Lang) was the Piarist educationalist Raimund Zobel. After the restart of 1802, the university, the grammar school and the Konvikt occupied adjacent buildings. Of course, entering the Konvikt implied attending one of these educational institutions. Left: Franz Innozenz Lang, Direktor, Stadtkonvikt, Vienna. ND. 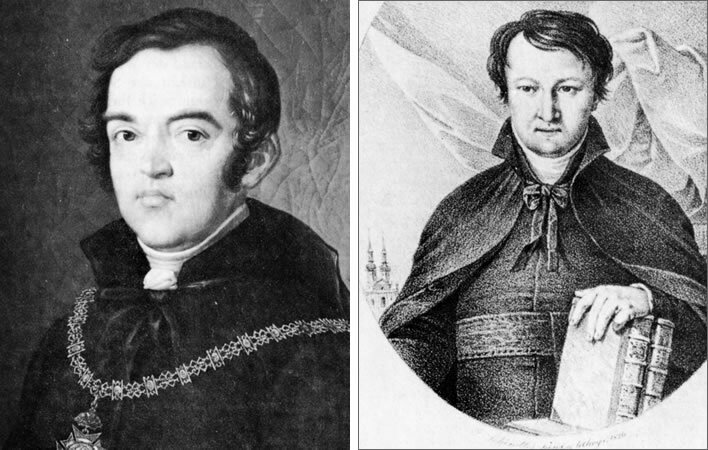 Right: Joseph Walch, mathematics professor and prefect at the Stadtkonvikt, from 1820 Direktor. ND. Lithograph after a sketch by Joseph Schindler. 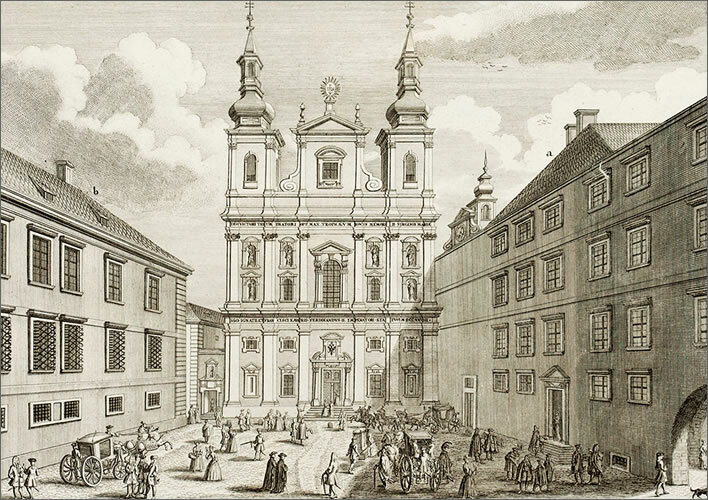 Note in the lower left of the illustration the rough sketch of the twin spires of the 'Jesuit Church' that stood next to the Stadtkonvikt. The Sängerknaben were a group of around ten boys who performed in the choir in the Hofkapelle, the Court Chapel. They also attended the grammar school and boarded in the Konvikt. A balance always had to be struck between their choral duties and their school work. The once irksome church schedule of the choristers (890 hours a year!) had only recently been reduced to give them more time for study. A Sängerknabe in uniform, after a watercolour by Leo Diet (now lost/stolen). There is uncertainty whether this was the uniform of the choristers or the pupils of the Akademisches Gymnasium or of the Konvikt as a whole. The latter seems implausible. Descriptions of the uniform vary from this illustration. At one time in the archive there were drawings with cloth samples attached, but these are now also lost/stolen. Innozenz Lang was an educationalist and also a music lover. It was he who was so passionate about the programme of symphonies and overtures performed in the Konvikt in the evenings. Under him the Sängerknaben and orchestra of the Konvikt flourished. They reached a high, widely-recognised standard. When Lang's deputy, Franz Xaver Schönberger, succeeded him in 1817 the emphasis changed, placing more weight on academic studies. As a result, by the time of Schönberger's death in 1820 the quality of the music in the Konvikt had declined considerably. Even during the admission tests, Schönberger had preferred academic excellence over musical talent. Had Schönberger and not Lang been in charge during Schubert's time our composer's life in the Konvikt might have been very different. He might not even have been accepted. School classes were held in the Akademisches Gymnasium, the Konvikt housed all the the boarding facilities for the pupils: dormitories, day rooms with desks and tables and dining rooms. The Konvikt also provided accommodation for those attending the University of Vienna, principally students of Law and Theology. In many ways the Konvikt acted in loco parentis, thus taking on what seems to be a superior role to the Akademisches Gymnasium itself. We can see this 'unity in duality' in the differences in pupil reports. 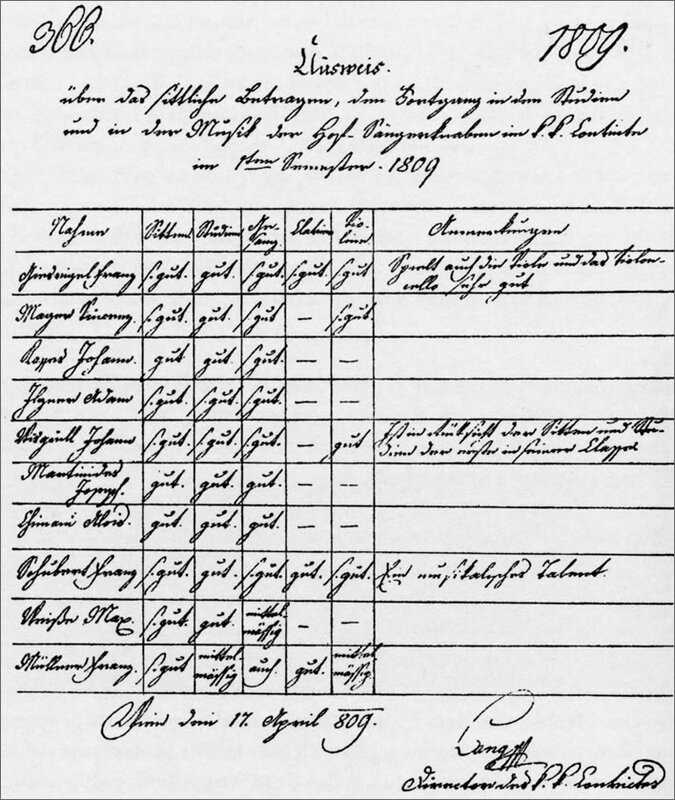 For each of his terms in the Konvikt Franz Peter has two reports: one from the Akademisches Gymnasium that strictly concerns his studies, listing his results in the various subjects, and one from the Konvikt that scores his behaviour, his musical work and sums the results of his studies. The report from the school expressed his performance in each subject in a strange single digit with binary meaning: '1' represented 'acceptable' or 'passed'. A swot might occasionally attain a '1em' ('eminent'). '2' or sometimes '3' meant 'unacceptable' or 'failed'. More than one of these in a year would be cause for ejection from the school. In contrast, the report from the Konvikt is an abbreviated phrase: 'gut', 's. gut' etc. 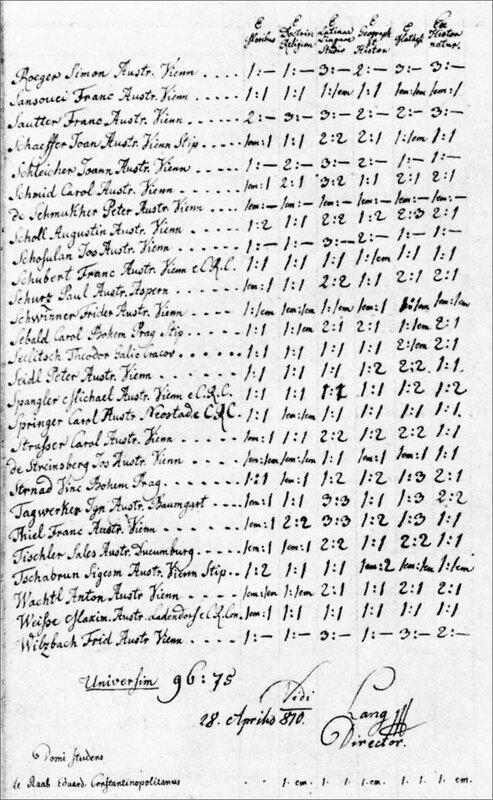 The catalogue of marks for the school year 1809 for the first of the four 'Grammar' years in the Akademisches Gymnasium– Franz Peter's first school year. Of the 27 boys in this list (R-W), four are resident in the Konvikt (C.R.C.) and two of these are choristers (Schubert and Weiße). In the first semester there were 96; in the second 75 boys (i.e. 21 dropped or thrown out). The marks are in pairs for each subject: the first semester, a colon and then the second semester. Franz Peter's results are on the tenth line. He obtained a '1em' in his second semester of 'Geography/History', taught by Prof. Rittmannsberger. NB: As we might expect in the Habsburg Empire of Paperwork, these catalogues were drawn up in several formats. A catalogue was also printed, presumably for the delectation of parents. The report on 'the behaviour, the progress in their studies and in music of the court choristers in the 1st semester 1809', Franz Peter's first school year. Franz Peter's entry is the eighth. The headings are: Nahmen Name, Sitten Behaviour, Studien Studies, Gesang Singing, Klavier Piano, Violine Violin, Anmerkungen Comments. Franz Peter obtained a 'good' in his 'studies' and 'piano', 'very good' in everything else – behaviour, singing and violin – and a comment: 'A musical talent'. We should point out the obvious: the boarding facilities of the Konvikt for choristers, general pupils and university students were necessary because in those days transport was bad. The choristers were anyway a special case, as they had extensive extra duties, but for many school pupils and university students the commuting times involved necessitated residential accommodation. Music should not just be seen as a means for the education of the aesthetic sense and as the most innocent and noblest entertainment but also by at least the majority of the boarders as an integral part of the educational body. 'Handschreiben Franz II, 25. März 1802' quoted in: Deutsch, 'Das k. k. Stadtkonvikt zu Schuberts Zeit', p. 479. Translation ©FoS. Did father Schubert hear of the emphasis on music that there would be in the new Konvikt? Was that the moment that he conceived his grand plan to get a free education for his musically talented son? Who knows? We do know, however, that in September 1804, only a little more than two years after the reanimation of the institution, his son Franz Peter would be singing in front of Antonio Salieri in that first proficiency test. The fees for the ten choristers were paid for by the Emperor. Most of the other pupils were financed by scholarships and grants. By 1800 there were about 25 foundations offering scholarships for the Konvikt and a similar number (with some overlapping) offering scholarships to the Akademisches Gymnasium. Large sums of money that were left over from the extinction of its Jesuit predecessor flowed into the coffers of the Konvikt. A few pupils were paid for by their families. The annual costs of boarding and teaching were not cheap – a multiple of an assistant teacher's annual income, for example. Without a scholarship this educational path was completely out of the reach of the lower orders. Thinking of this, we realise just how good father Schubert's plan had been. There were other residential schools in socially stratified Vienna. Whereas the Stadtkonvikt generally took children of bourgeois families, the top schools in Vienna at that time were the Theresianische Ritterakademie and the Löwenbürgisches Piaristenkonvikt, favoured by the aristocrats and the monied. The reputation of the Stadtkonvikt, however, was enhanced by its proximity to the university and the quality of its musical culture in music-mad Vienna. Franz Peter was one of about 100 students who were boarding in the Konvikt. Because the Akademisches Gymnasium and the Konvikt are so closely intertwined, the organization of the Konvikt reflects to a large extent the organization of the Gymnasium. Boarders were divided up into three groups: 'Small', 'Medium' and 'Large'. The 30 boys in the 'Small' group were attending the first four years of the Akademisches Gymnasium course, the so-called 'Grammar' years. Another 30 boys were in the 'Medium' group. They were presumably from the two 'Humanities' classes (inferiora) and the two 'Philosophy' classes (superiora). The 20 members of the 'Large' group were presumably university students using the Konvikt as a hall of residence. There were also a further 20 Theology students, who were accounted for separately. The standard course at that time at the Akademisches Gymnasium took six years and consisted of four 'Grammar' years and two 'Humanities' years, the inferiora. A further two years of 'Philosophy', the superiora, was the immediate preliminary to a university course. The university course would then be three or more years of one of the university disciplines such as Jurisprudence, Philosophy, Medicine, Theology etc. The boarders slept in dormitories. Our knowledge of the sizes and number of the various dormitories and how they differed between age groups is very limited. Each pupil had a bed, a table and chair and two lockable drawers in a chest of four. There was a nightlight in a glass and lamps burning oil or pig-fat. There were cooks, servants, chamber maids and on the door a uniformed porter. Every dormitory of pupils had a uniformed servant who cleaned the rooms and the clothes, made the beds, cleaned and polished the shoes, cleaned the cutlery, bottles and glasses, laid the table, served the food and carved it at the table, repaired clothes, looked after the little ones and slept in a dormitory with the pupils. Once or twice a week two women came to 'clean heads' and comb the pupils' hair – part of the hopeless battle against lice and fleas. The battle was lost and always would be as soon as the pupils put on their uniform wigs. Although the inmates had to cope with frequent drudgery, regimentation and the unremitting rule of the supervisory teachers known as 'Prefects', their lot was not Dickensian – not Dotheboys Hall, say, in Nicholas Nickleby or Oliver Twist's life in the workhouse. The pupils were certainly not living in a hovel. We must remember, too, that for most of the lower orders in Vienna space was at a premium. People naturally lived on top of each other: 'personal space' was a great luxury. Schubert's life in the Konvikt was probably much more spacious than his home life. One thing he did complain about was the food, always a matter close to Schubert's heart. The Emperor himself – one of history's great micro-managers –	had specified that the food in the Konvikt should be 'sufficient in quantity, edible and clean', all of which are matters of interpretation for a staff working to a tight budget under penny-pinching micromanagers. … I have thought for a long time about my situation here. Although on the whole it is good, there is room for improvement here and there. You know from experience that now and again one would like to eat a bread roll or a couple of apples, especially when, after a unexceptional lunch, it will be 8½ hours before you get a miserable evening meal. This frequent desire has become ever more frequent and one way or another I have to do something about it. Deutsch, Dokumente p. 22. Translation ©FoS. We assume that Franz Peter had not managed to move his father's thrifty heart, or, more likely, had probably not even tried to do so, knowing perfectly well what the answer would be. Whether he eventually got the cash for his afternoon snack from one or the other brother is unknown. His ability to quote scripture confidently with completely incorrect source attributions is impressive. We may, of course, just be listening in to some fraternal joke about which we know nothing. The Konvikt is to be understood as an establishment within the Habsburg Empire of Paperwork. The organigram for the Konvikt and the Sängerknaben stretches down from Franz II himself through various aristocratic bureaucrats of decreasing nobility. Readers will be relieved to know that they will be spared the detail of these glittering upper layers. Underneath the bemedalled pile were a singing teacher, a violin teacher and a piano teacher. The latter, Wenzel Ružička [~pron: roojitshka], was an extremely capable man: a long time organist to the court, a viola player at the National Theatre, an expert in Generalbass, 'basso continuo', so important for 17th and 18th century composition. After Michael Holzer he was, according to Otto Deutsch, the most influential teacher of composition for Schubert. Like Holzer, too, Ružička recognised Franz Peter's compositional skills, his intuitive understanding that seemed to come from 'the dear Lord'. Schubert was lucky to have someone like this, who, instead of the contractual three times a week, came to the Konvikt without pay often twice on every day to take advantage of the recreational time of the boys. He also taught cello and viola and his dedication resulted in the excellence of the school's orchestra, which performed a symphony and at least one overture every evening. Twice a week starting in 1812 Schubert would also receive free lessons in composition from the great Antonio Salieri himself. Schubert was proud to be able to call himself a pupil of Salieri's. Everything we know about those lessons indicate an exceptional teacher-pupil relationship based on mutual respect. On occasion Salieri would treat his pupils, among them Schubert, to an ice-cream or sorbet from a 'lemonade hut' in the Vienna Graben. Schubert dedicated a number of his works to Salieri. Yet this humane man, who supported Schubert in every way, is nowadays because of Schaffer's play held to be the man whose insane professional jealousy wrecked Mozart's career. Even in Schubert studies we all too often come across the assertion that the Italian Salieri had contempt for the German language song and opera that so enthused Schubert. Whatever the evidence, Salieri always has to be the baddie. If we were not at first completely convinced, we must now accept just how inspired father Schubert's scheme to get his son into this environment was. The Stadtkonvikt	was not just the important educational Gymnasium, but a musical hothouse, a music academy in everything but name – on warm summer evenings some of the music-mad Viennese would stand under the open windows of the Konvikt in order just to listen to that orchestra. Resulting from the cooperative fervour of the pupils the instrumental music in the Konvikt had reached a level that would rarely be encountered in such youthful amateurs. The evening was dedicated to the performance of a complete symphony and some overtures. The power of the youthful orchestra was sufficient to perform the masterpieces of Haydn, Mozart and Beethoven with great success. Barely 12 years old [Spaun was 21], Schubert played the second violin in the orchestra. His extraordinary commitment to the performance of the works brought his superior talent to the attention of the others so that before long the little boy was the leader at the head of the orchestra and all the adults were happy to be subordinate to him. Deutsch, Erinnerungen p. 24. Translation ©FoS. Franz Peter, stimulated by this musical environment, had to come to terms with the academic drudgery in the Akademisches Gymnasium and the long shadow it cast into the Konvikt. He was not a troublemaker or a difficult child – on the contrary he was respectful and obedient – but the temptation to leave the boring repetition of schoolwork to one side must have been very great. Nevertheless, the results in his school reports – until his last year, that is – are acceptable: always '1' from the Akademisches Gymnasium and always 'good' or 'very good' from the Konvikt, often with an additional remark such as 'a musical talent'. We moderns would find the curriculum of the time and the manner of teaching it excruciatingly dull, consisting as it did mostly of memorisation. We discussed this theme in respect of the drudgery of the Jesuit education to which Schubert's father and uncle had been subjected. The situation in the intervening 40 years, with or without Jesuits in control, stayed much the same. Nevertheless, Schubert went through five years consistently obtaining acceptable marks in all his academic subjects as well excellent marks as for behaviour, application and religious studies. In front of our eyes a howitzer fell on the University Square and burst in one of the beautiful fountains there; suddenly there was a crash in our building: a howitzer had landed on the Konvikt. It passed through all the storeys right down to the first one and burst in the first storey in the room of Prefect Walch, who was just turning the key to enter. It was extremely lucky that the prefects in all three storeys were not in their rooms, otherwise all three may have been killed. The wags among us regretted how it had happened, since otherwise we would have been freed from three unloved tormentors. Ibid, p. 407. Translation ©FoS. At a chance meeting he [Schubert] whispered to me: 'You are the person I like best in the entire Konvikt, I have no other friends here.' Another time he said to me: 'You, fortunate one, are about to escape this prison; I'm so sorry that you are leaving'. Ibid, p. 148. Translation ©FoS. Musically the Konvikt was a wonderful environment for our budding genius – academically, less so. Nevertheless, the respectful and obedient Franz Peter had done what he had to do and achieved acceptable – if not spectacular – marks for his academic studies for four and a half years. Unfortunately, in his school report from the Akademisches Gymnasium in September of 1813 he had been failed in mathematics by Prefect Walch, his teacher. Even had he still been a chorister this would have been an impediment to his further stay: choristers had to obtain acceptable grades in all their school subjects. But his voice had broken in July 1812, rendering him useless as a chorister. According to the rules Franz Peter now became eligible for one of the scholarships that were available for just this purpose, to allow former choristers to continue their studies in the Akademisches Gymnasium and their accommodation in the Konvikt. But also according to the rules, his school work had to be impeccable, just as much as if he had still been a chorister. It was Schubert's misfortune that a revolution had taken place in the management of the teaching just at the moment of the foundation of the reawakened Stadtkonvikt, a revolution that would make Schubert's life in the school a lot tougher. This revolution involved no change in the curriculum but a much stricter supervision of teachers. Up until then, teaching staff had been left very much to their own devices. Teaching became sloppy and along with that so did the marking of the pupils. It was found that many boys had been given high marks in reports that in no way reflected their level of knowledge – or, more accurately, the depth of their ignorance. At the foundation in 1802 of the Stadtkonvikt, Innozenz Lang, its new Director and the school inspector for all the other Gymnasia in Vienna and Lower Austria had been involved in the investigation into this problem and acted to remove these defects, presumably starting with his own school, the Akademisches Gymnasium. In a process all too familiar to close observers of the Habsburg Empire of Paperwork, a system that had declined into that corrupt, slightly malodorous sloppiness that adds so much charm to Austrian life was beaten with a regulatory hammer to become a mess of acribic prescriptions and extreme punishments for non-compliance. Just a few years before Schubert arrived, therefore, a new system of regular checks on teachers' performance and the performance of their pupils had been instituted. The Prefects were to keep a close and continuous eye on subject teachers, involving sitting in on classes. In turn the Prefects were to be inspected more closely by their own superiors. In sum, a classic scheme to generate even more supervision, scribbling and rule-following. We can say without hesitation that under this new, tough regime the good marks that Franz Peter gained in the Akademisches Gymnasium must have been well deserved. It also explains the later inflexibility of the treatment of him, when after five years, his marks in mathematics slipped slightly. We can imagine that under the old, 'flexible' system, Franz Peter's defective marks in mathematics would have been massaged in order to keep this talented boy in the school, even though his voice had broken and he was no further use as a chorister. The new ethos did not allow this. There are many Schubertians who blame Prefect Joseph Walch, the mathematics teacher, for Schubert's demise, but there was really nothing Walch could have done. Under the new dispensation he could not manipulate Schubert's results even if he had wanted to: the risks were very real. It was not out of the question that, just as in 1802, an independent investigator might come and interrogate Schubert on his mathematical skills and find him wanting, undeserving of Walch's massaged marks. A more likely case would be that Lang or someone else would sit in on one of Walch's classes and expose Franz Peter's ignorance. Schubert's fellow students would have soon ratted out any preferential treatment, complaints would have been written, enquiries set in motion. Were that to happen Walch's career would have been at an end, whereas in reality his career progress was untroubled: he went on to succeed Franz Xaver Schönberger as the Director of the Konvikt in 1820. 28 May 1812 – His mother Elisabeth died of typhus. She was 'a quiet woman, greatly loved by her children and universally respected'. She raised little Franz Peter 'with great care and maternal tenderness'. She is a heroine in the Schubert biography, who suffers the standard fate of the lower order female of the time: her ancestry barely recorded, her presence invisible, her character and opinions unknown, her image never recorded. After bearing 15 babies, raising five and supporting her husband in ways no one bothered to record she passes back into oblivion leaving hardly a trace. June? 1812 – Franz Peter began his studies with Salieri. 26 July 1812 – Franz Peter's voice broke, bringing his time as a chorister abruptly to an end. Even a genius is not immune from the effects of the strange hormones coursing through his body. Perhaps the obedient and deferent little boy became slightly less so. 24 November 1812 – The growing boy was hungry: Franz Peter wrote the begging letter (reproduced above) to one of his brothers. 25 April 1813 – his father married Anna Kleyenböck. 19 August 1813 – The worms turned, at least for a while. There is uprising in the Konvikt and the authority of the 'tormentors' is questioned. This is a big subject that we will deal with in a separate piece. September 1813 – The report of the Akademisches Gymnasium shows that Schubert has failed the year. Let us be clear: there was no administrative ill-will against Schubert. Many, particularly Innozenz Lang, wanted to keep him and support his further education. It would be unfair to represent the authorities as being heartless rule-followers who extinguished the career of the musical genius. Thus, despite the rigidity of the school rules, Schubert was thrown a thin lifeline. Franz II – who should now be correctly titled Franz I, Emperor of Austria – personally intervened in the matter on 21 October 1813, in an order written from Saxony two days after the three-day long Battle of the Nations at Leipzig. That's how it was in the Habsburg Empire of Paperwork: the entire correspondence about the fate of the three choristers whose voices had broken was copied and paraphrased and re-copied by hand and galloped from Vienna to Leipzig to finally land on the Emperor's desk in Rötha Castle, the headquarters of the Austrians and Russians for the battle. Only two days before that, more than 90,000 men had been killed or wounded in what turned out to be the bloodiest battle before the First World War, a battle that had sealed Napoleon's ultimate fate. Perhaps we should rename it the 'Battle of Schubert's Soprano'. These boys were, after all, Franz's choristers and so it was he who had to decide how to spend his money. The silent dead were still being dragged from the battlefields, the mutilated still groaning on their stretchers as Franz was being asked to decide the fate of Franz Peter Schubert. We have to wonder at the apparent compartmentalisation of Franz's brain: emperors are really not like us. He had already spent around 1,500 Gulden (C.M.) of his own money on his golden chorister Schubert. Should he allot, say, 500 Gulden from someone else's bequest to complete the boy's education? 'Yes', it seems. The Emperor offered an unconditional scholarship to Schubert – but it was too late. Schubert resigned from the Gymnasium and the Konvikt sometime around the beginning of November 1813. He was 16 years old. It surely cannot have been his decision alone: perhaps he spoke to Salieri, Holzer or Ružička about the situation. Salieri may have told him that his lessons with him would continue unimpeded. Perhaps he spoke to Spaun or other friends. Perhaps he didn't speak to anyone, such an introvert was he, and decided all on his own that more Greek grammar and Latin prosody were not really what he needed in his life at that moment. Perhaps he was tired of begging for money for food and relying on the charity of friends to provide pre-ruled music paper for his compositions. Perhaps the uprising that took place in the Konvikt that summer, together with his raging hormones, had made more years of well-behaved docility in the Konvikt intolerable. His father probably agreed with him, too: the plan had worked, the family school in the Säulengasse was flourishing and an assistant teacher would be very welcome. Franz Peter's five years in the Konvikt and at the Akademisches Gymnasium had run their course. Time to move on. Deutsch, Otto Erich, ed. Schubert: Die Dokumente Seines Lebens, Wiesbaden: Breitkopf & Härtel, 1996. —, Schubert: Die Erinnerungen Seiner Freunde, Wiesbaden: Breitkopf & Härtel, 1997. —, 'Das k. k. Stadtkonvikt zu Schuberts Zeit', Die Quelle, Wien, 1928, Folge 4, p. 477-490. Geusau, Anton Reichsritter von, Geschichte Der Stiftungen, Erziehungs- Und Unterrichtsanstalten in Wien, Wien, 1803. Hilmar, Ernst, Franz Schubert, Reinbek bei Hamburg, Rowohlt, 1997. Hoorickx Reinhard van, 'Schubert: Further Discoveries since 1978', The Music Review, 1989, Vol. 50, p. 117f. Knaus, Herwig, Franz Schubert: Vom Vorstadtkind Zum Compositeur, Wien, Löcker, 1997. Pagel, Maria Benediktine, Die kk Hofsängerknaben zu Wien 1498 bis 1918, Böhlau Verlag, Wien, 2009. Some trivial additions, mainly to the captions of the two images of the school reports.